Honest, independent, and well known restauraunteur with more than 40 years experience in the industry. Alberto has traveled extensively in Europe and South America and has toured the United States in the culinary industry. Alberto started his endeavors in Chicago's world famous Pump Room. Alberto then relocated to Miami and worked as a Maitre'd at the Royal Biscane Hotel. Following, Alberto became the food and beverage director for Ramada Hotel Corporations. Alberto opened his first restaurant Chalet Gourmet in 1976, an instant success. In the mid 80's Alberto went to work as the catering director and Maitre'd for the famous Dominique's Restaurant at the 5 star Alexander Hotel in Miami Beach. 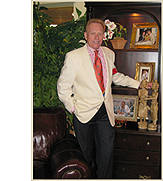 Alberto has been a restaurant consultant for the Sheraton Hotel in Key Largo and the exclusive Cricket Club in Miami. In 1988 he opened the upscale Alberto's 51 in Miami Beach. The restaurant garnered widespread acclaim. The beautiful and unique restaurant The Quilted Giraffe opened its doors in 1998 in Vero Beach, Fl. For the last 13 years the restaurant has been a landmark in Vero Beach. He recently sold the business in September 2011 to dedicate his time to help other restaurant owners who need his knowledge as a restaurant consultant and use his flair and experience as a party planner. Do you know how to fill your empty tables? Is your bar as profitiable as you think it should be? Can your your food cost expenses be reduced? Alberto Luis can answer these questions. Parties by Alberto. All-inclusive event services and creative designs, weddings, corporate events, holiday parties and a variety of other memorable celebrations.